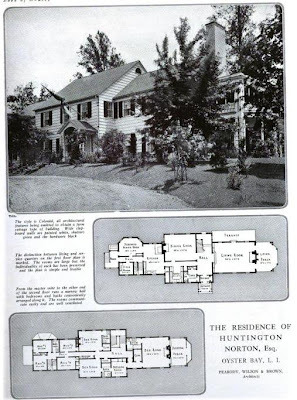 'Notley Hill', the residence of Huntington Norton designed by Peabody, Wilson & Brown c. 1919 in Oyster Bay. This house was built in between the Barnes and Ladd residences (shown the last two days) in the Long Island Farmhouse style more typical of Peabody, Wilson & Brown. Click HERE to see 'Notley Hill' on google earth. Sweet but suburbia was once filled with similar structures. Perhaps not so large in scale but this is the kind of house I associate with, say, Dallas in the 1930s/40s or practically anywhere posh. The couple's city address was 131 East 66th Street, NYC, and later at 690 Park Avenue. Mrs Norton was the former Marie Adèle Montant (married 1906), whose parents', Mr and Mrs Auguste Philippe Montant, had a country house at Oyster Bay called Ramsbroke. Mr Norton (J Huntington Norton) was the son of Frank L Norton. He married, as his second wife, Helen Cadley (née Helen Lambert Keepers, formerly Mrs Charles Paul Cadley). What strikes me is that while this house is smaller than the uber-MacMansions that litter the area today, it is infinitely more attractive! It's still standing at 96 Cove Road. Great to see all these wonderful houses. Any info. on the Ambrose Clark house or the Ogden Reid house? Thanks Zach! Very nice. Hoping that a sales brochure will turn up one day with some interior shots & floor plan too. Thanks.